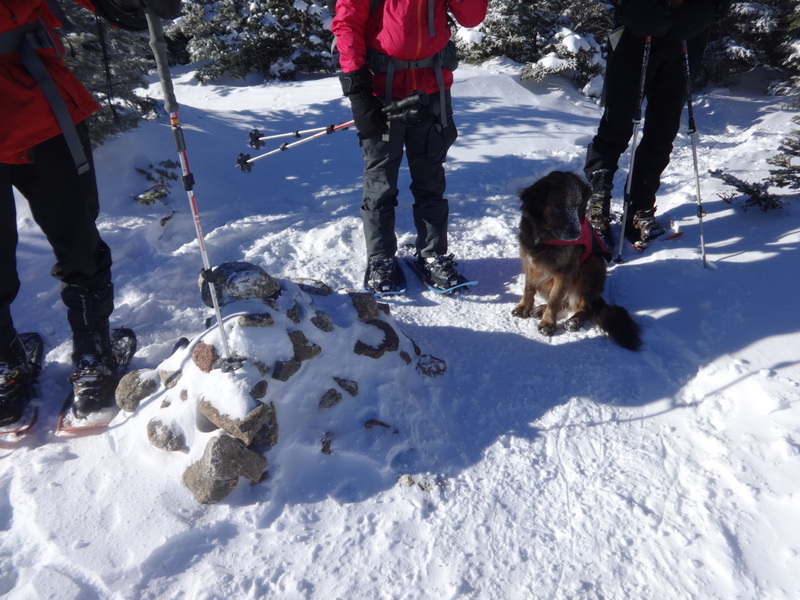 My young k9 companion Lucy and I team up with our friends Heather with her dog Kali and their friend Dan for my birthday hike! 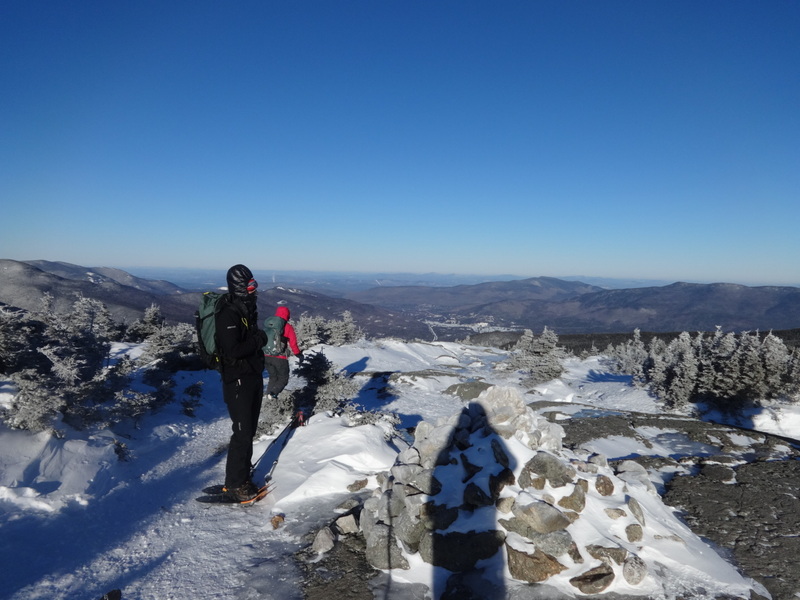 Jay Morse also joins us briefly to hike some more peaks in our goal of a single season Winter 48. 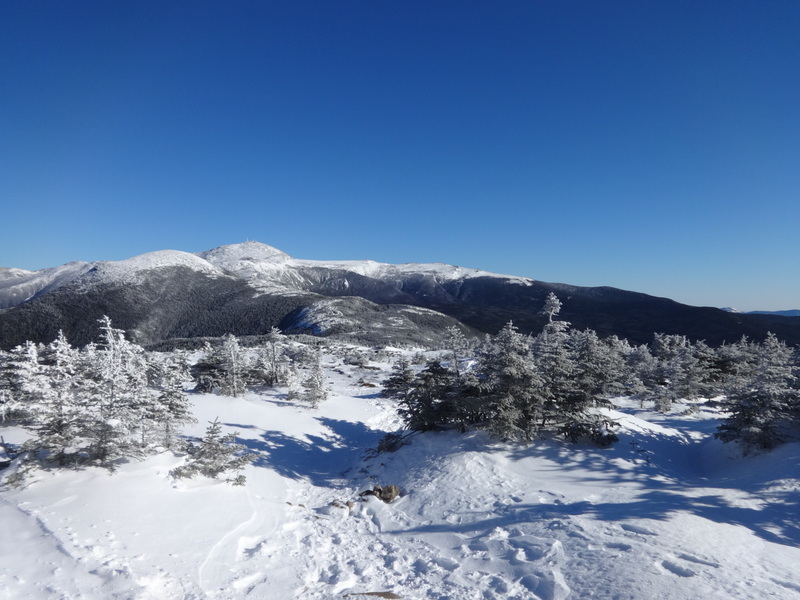 A snowshoe adventure across the lower presidential range is met with low temperatures and high winds in what might just be the coldest day I have ever experienced on the high peaks of New Hampshire. We were up early on Saturday. Abby was taking Patton along so the 4 of us finished loading up the car. We were on the road around 4:30. Our car ride was filled with coffee, egg sandwiches, and doughnuts. 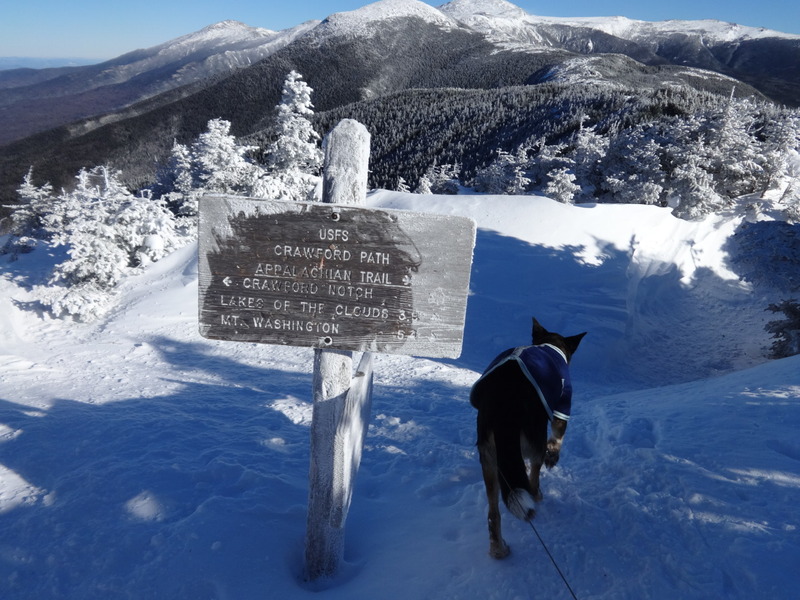 When we got to Crawford notch it was cold, around -9 F in Crawford notch. I couldn’t even stand still outside. We went over to the Highland center quickly and I got some hot water. In the parking area to the trailhead I had a conversation with another peak bagger as we both go ready to deal with the harsh cold ahead. I started my hike in a hat base layers top and bottom. Heavy smartwool socks in my insulated boots. Over the top base layer I wore a light button up synthetic shirt and. A fleece vest. On the bottoms I wore a light pant and Goretex gators. I pack heavy but in my pack I had my Goretex rain pants another base layer top. 2 mid layers, a light fleece and a down jacket. I would both the mid layers a one point or another during the day. I left Abby and Patton behind in the warmth of the car. 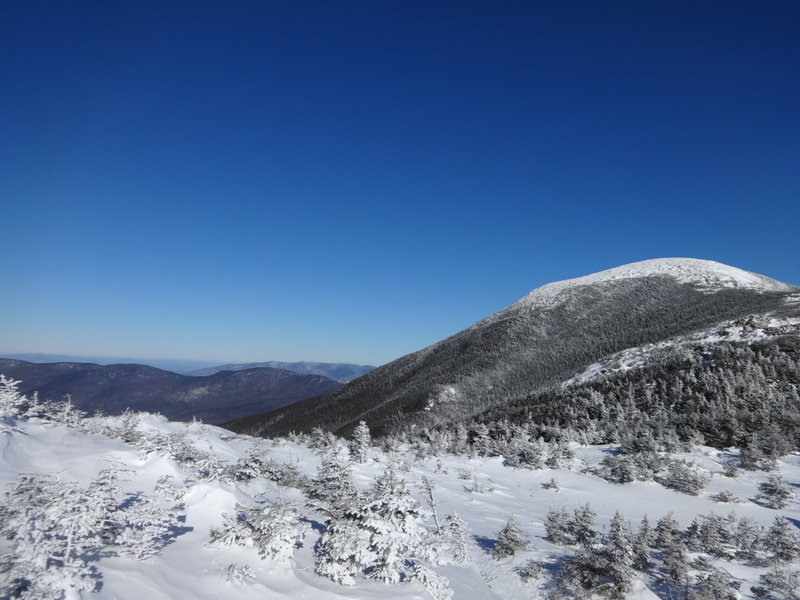 It was around 7:30 when we started hiking up the frigid Webster – Jackson trail. The hike up Jackson though cold went quickly. 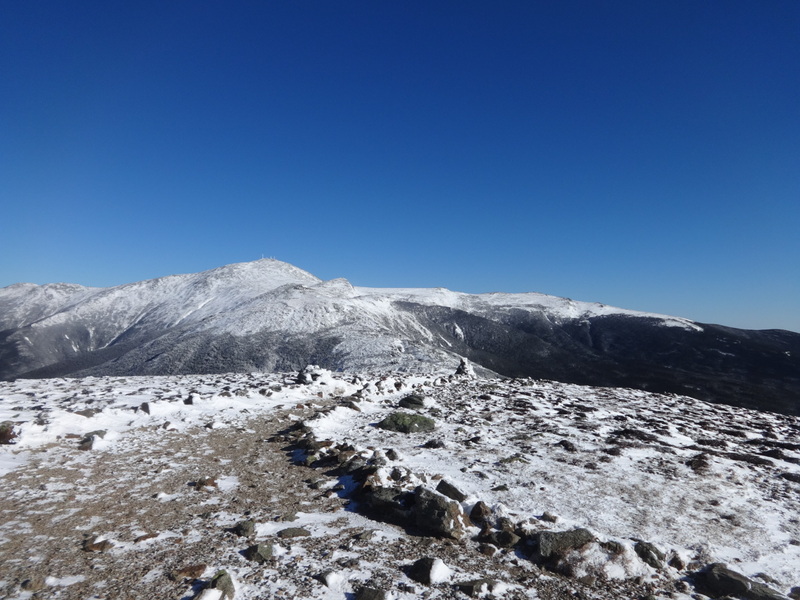 We reached the summit at 9am. It was incredibly windy and cold. I had a head piece on but nothing over my face. I took 2 pictures before my camera freezed up. It was the coldest thing I ever felt. I ran off the summit with the rest of my party. “Your nose is all white. Cover it up! Heather told me. It did not hurt but she was right. I was foolish to be up there without protecting my face. It did not happen again the remainder of the hike. Once under the comfort of treeline we moved on for Pierce. There was a fellow with a nice camp set up at the tent sight we said hello and had a snack. 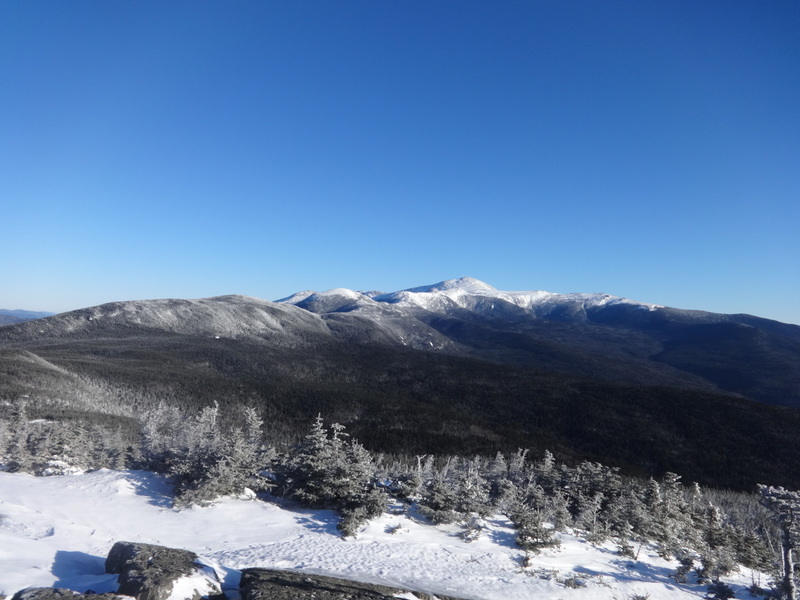 From here I switched on the elevated heel of my snow shoes and made for the summit. What a clear day. 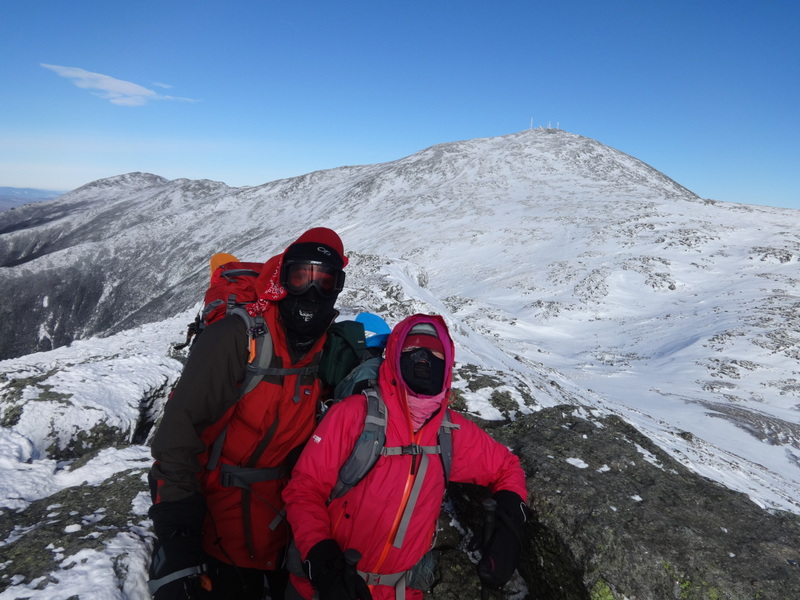 It was still very cold as we reached the top of Pierce. Such a lovely sight! At this point Jay wished me a happy birthday. He had to move on with the day a go down. We parted ways and I moved on with the party. 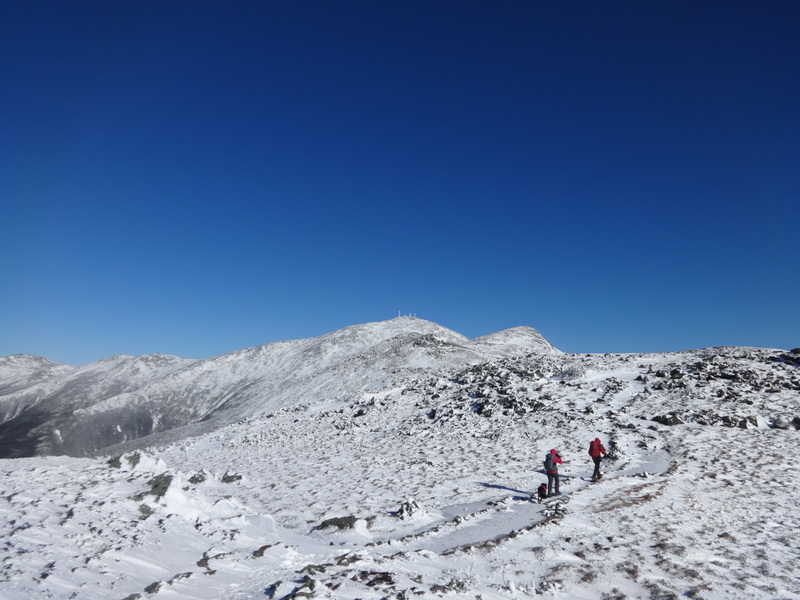 The hike up Eisenhower was not as bad because the mountain was blocking the north westerly winds. Once on top though there was a real reminder of the importance of covering up. 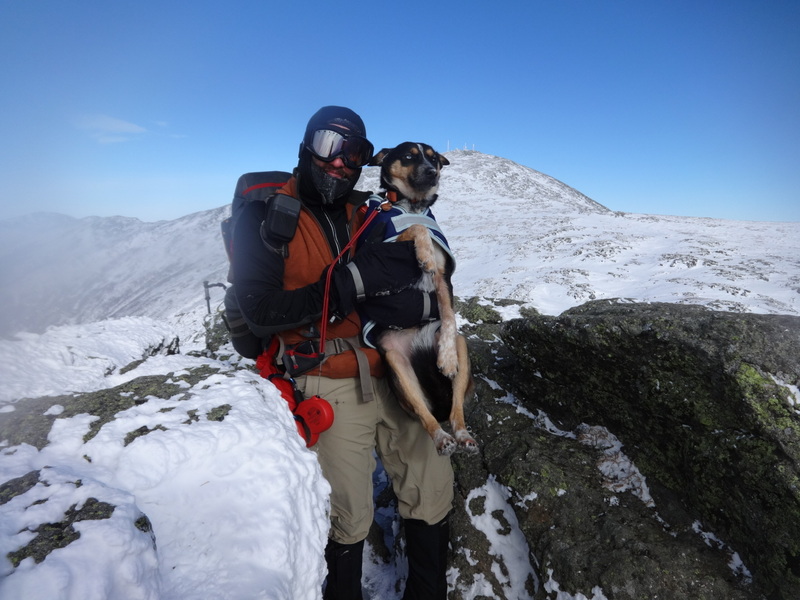 I did and with goggles on and all I moved on with Lucy by my side down from the summit on the way to Monroe. With the open exposure and the length to Monroe this section proved to be difficult. It was also rocky so we switched over to micro spikes. This gave us a bit of mobility back. The summit was bitterly cold and we did not have much time for exposure. The crew was singing happy birthday to me as we reached the summit. It was funny in the extreme cold. 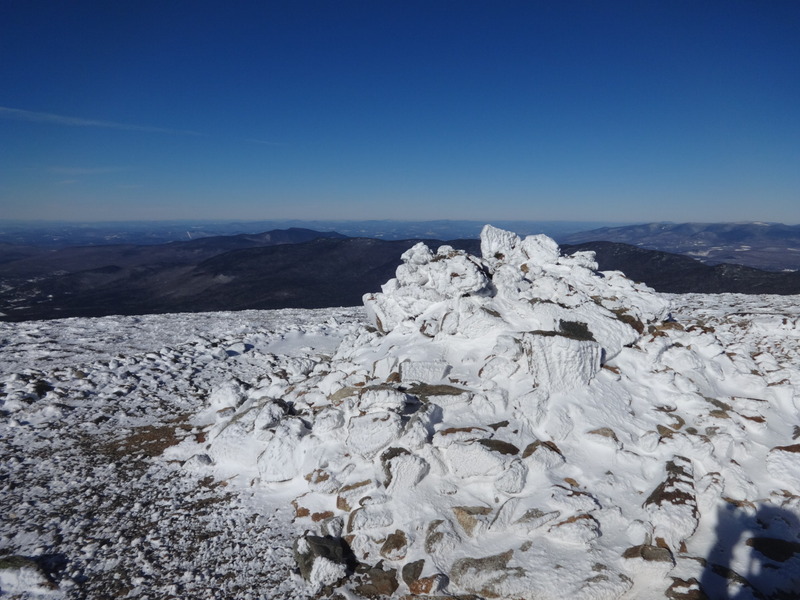 We got our summit pictures on the freezing summit and made for the Lake of the clouds hut to get out of the wind. 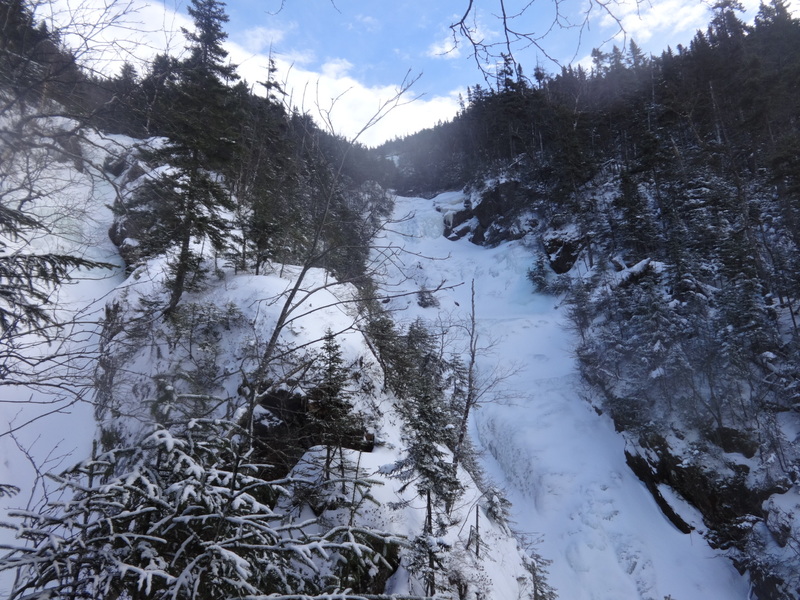 Once at the hut we made our plans to go down the Ammonoosuc Ravine trail. We had a drink from my flask to celebrate my birthday and to help warm up. Our day was coming to an end but it was a fantastic day for a self test against the bitter cold. It was also great for hiking experience with Lucy. On the way down we got the lovely scenes of the frozen waterfalls. A great end cap to a birthday hike. I got ahold of Abby and she met us at the parking lot at the end of the Ravine trail. It was great to have the mobile car spot. What a hike! 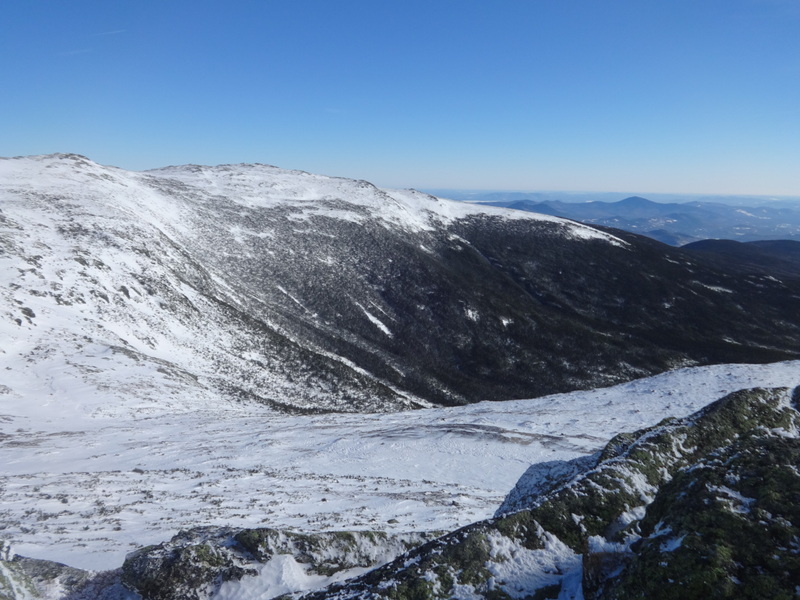 With this hike Lucy and I are at 21 on our single winter season New Hampshire 48 attempt. Check our next report coming up on mount Isolation! I read your trip report post on vftt and thought nice hike. Then I noticed the link and wondered if it might be you 🙂 Glad I came to see the pics. That looks like a great way to celebrate your birthday! Thank you for reading as always. I have come to the tradition of spending my birthday in the mountains and have come to love it so. Did this storm come through as rain or snow over there? We had warm rain here all night and lost most of our snow cover again. 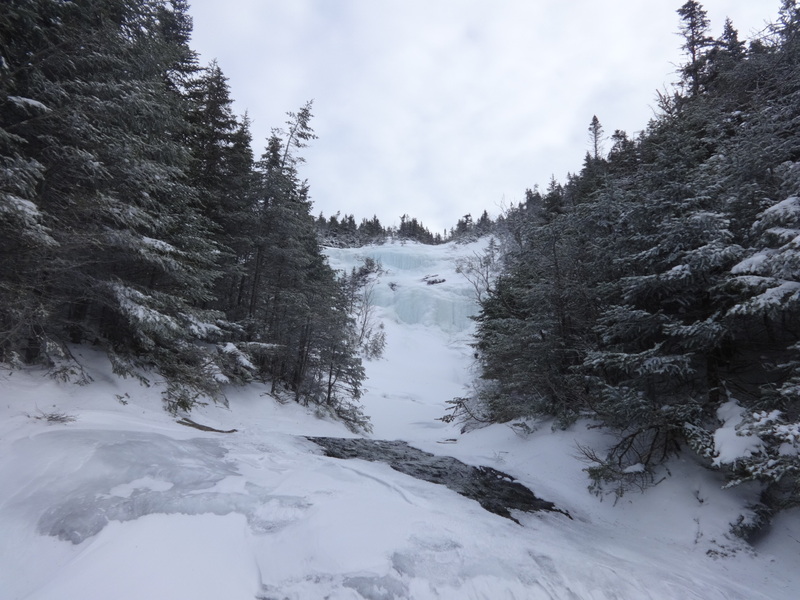 Was planning on snowshoe camping in the Pemi this weekend but now I’m afraid its all turned to ice. It started to sleet and rain when we were coming down engine hill. Sloppy ride home.